So, below is her list of 25 myths about the flu vaccine, with links back to her article (and in some cases, to this blog too) that debunk the myth. After you read this, share it with everyone. Your neighbor who won’t get the flu vaccine. Your spouse. Your parents. Your coworker. And one more person–yourself. 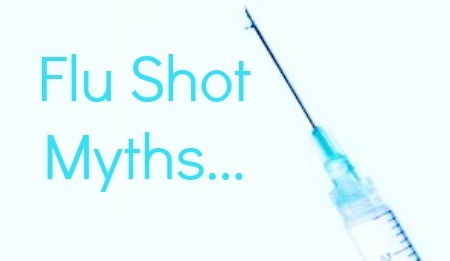 So there it is, 25 myths (and 3 sub-myths) that are commonly heard about the flu vaccine. People die from the flu, so unless you’re a serious dumbass about flu vaccinations, it’s time to set aside the myths, ignore the slight sting of the needle jab, and get immunized against the flu. I really want to thank Tara for this list, one that, as she states, is long overdue. Visit her blog, Red Wine and Apple Sauce. Follow her on Twitter. Like her Facebook page about evidence-based parenting. One final comment. Isn’t it funny that those of us who think vaccines help people, provide accurate, scientific information, can write a list like this? And the vaccine deniers can only use logical fallacies and cherry picking bad science to make a list of lies? Because vaccines save lives, and we have mountains of evidence supporting it. Thompson WW, Shay DK, Weintraub E, Brammer L, Bridges CB, Cox NJ, Fukuda K. Influenza-associated hospitalizations in the United States. JAMA. 2004 Sep 15;292(11):1333-40. PubMed PMID: 15367555. Wong KK, Jain S, Blanton L, Dhara R, Brammer L, Fry AM, Finelli L. Influenza-Associated Pediatric Deaths in the United States, 2004–2012. Pediatrics 2013;132:796–804. doi:10.1542/peds.2013-1493. Previous PostPrevious Vitamin D supplements–improves bone health or a waste of money?